By Walton Burns 20 January 2019 Activitiy, Classroom Management, Teaching TipLeave a Comment on What Do They Know About You? Why do I recommend a Get-to-Know-the-Teacher activity on the first day of class? I remember the first time I was grilled by a new class. I was teaching middle-schoolers in a public school in Kazakhstan and many of them had never seen an American before. I started the class off with a little orientation speech about class expectations and so on. A hand went up. I called on the student who asked, “What’s your favorite NBA team?” I said I wasn’t a big basketball fan, and the class exploded. I found myself explaining that I wasn’t a big sports fan, but I followed baseball (“Baseball? Ptui! Not a real sport”) and hockey (“Kazakhstan is number one in hockey. Many Russian national team players are from East Kazakhstan.”). When asked what I did like to watch, I told them action movies and mysteries, and I liked to read. And we went from there, chatting away in English. Every time I tried to get the class back on track, another hand would shoot up with a question. Some were sincere. Some were engineered to keep me talking and run down the clock. And some revealed a genuine curiosity about stereotypes, so it was nice to address those issues: Are all Americans fat? Do shoot-outs happen every day in big cities, like in the movies? Why don’t Americans know anything about Kazakhstan? Do they think we are all like Borat? As an American in a foreign country, I think this experience of getting the questions out was important and probably inevitable. In other classes, I haven’t allowed this kind of questioning, and that just meant the questions came out every day, bit by bit. I remember one student coming to class 20 minutes early to grill me about my life in the US! But any teacher in any situation is a bit of a VIP, particularly a new teacher starting a new class in a new term. Students want to know about their teachers. Sometimes they are figuring out what kind of person you are. You can usually tell from chatting with someone whether they will be strict or not, how good their sense of humor is, and whether seem like an intelligent and knowledgeable person. And these are valid things to know about your teacher. In fact, most teachers manage to insert this information in their first day speeches, directly or indirectly. When I teach young adults or professionals, a bit of small talk is expected because the students view themselves as my equal to some extent. It’s not uncommon for adults to engage in some small talk before engaging in professional activities. And just as students are sussing you out, you can feel them out too. Some students will be showing off what they know or how well they speak. Others will be clearly testing your limits. And some will reveal their hobbies and interests-like clearly my middle-schoolers loved basketball! So it really is helpful to let your students get to know you. And while chatting may work in some classrooms, I like to do an organized Get-to-Know-the-Teacher activity to ensure the class stays on track. Now, any icebreaker or get-to-know-you activity can be adapted into a get-to-know-the-teacher activity, often by just you participating as a student. But I still like to keep a few ideas in my back pocket that are particularly well-suited for helping students get to know you. One approach that a lot of school teachers take is the letter before class. 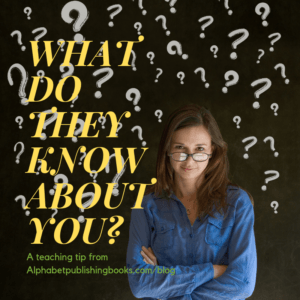 It might seem childish but sending out a letter or email with some basic information about you, your family, hobbies, interests, and class expectations can really go a long way to making students feel that they know you. And here’s another of my favorite get-to-know-the-teacher activities for the first day of class or school. Put a question mark up on the board and tell students that their job is to tell the class what they know or think they know about you. Set a very clear time-limit (5-7 minutes is usually enough). This can take a couple of forms. Students who know you already can contribute information, if any students have had you before. Students can also make guesses based on what they think they’ve heard or their stereotypes of teachers. You can then confirm or deny any rumors or belief. You can prompt them with questions and have them guess the answer, which is a good way to get out the information you want them to have, such as how long you have been teaching. This variation is not for the thin-skinned. I’ve gotten comments such as, “You don’t like sports because you don’t look fit.” But then that’s an opportunity to talk about polite and impolite language! This Get-to-Know-the-Teacher icebreaker always leaves you and the students laughing together, which is a definitely a good thing. Sign up for our mailing list, get updates, discounts, and free resources. And as a gift, we'll send you a free copy of our Creating Classroom Community Builders chart. Here's your DIY Creating Your Own Classroom Community Builder Chart.